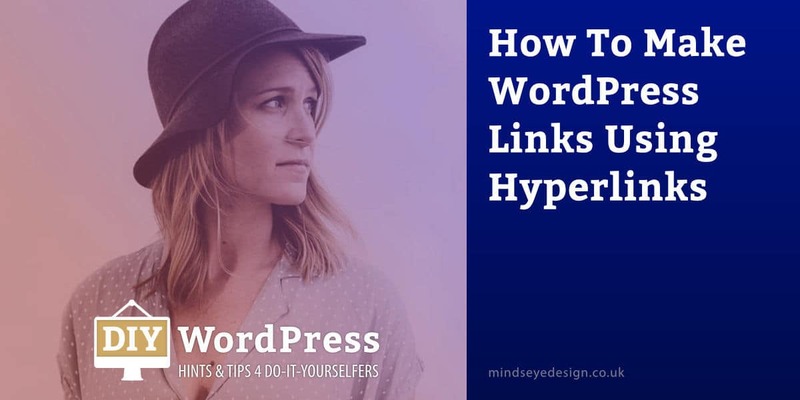 Simply put, a hyperlink is a link in one text document on the web, that links directly to another document, either in the same website or in a different website altogether. WordPress links enable you to click on a link and follow it to another piece of content on the web. How do I insert WordPress links into my post or page content? Adding, editing and removing links in WordPress is very easy. First of all, login to your WordPress admin area and navigate to the Post or Page that you want to edit via the links in the left Sidebar. Once you’ve opened the Post or Page, make sure you’re in Visual Editor mode as seen in the screenshot above. Now follow the steps below. Highlight the word or phrase that you want to link from. Click on the ‘Insert/edit link’ icon in the Toolbar. A pop-up box will appear above or below the word or phrase you have highlighted. Type or paste the URL (address of the web page you want to link to) into this pop-up box. If you’re done, you must click the white arrow in a blue box button to apply the link. For other options, read on. If you want to link to a post or page on your own site, click the ‘Link Options’ icon of the pop-up box to open a dialogue box (see images below). In the search box underneath ‘Or link to existing content’, type the name of the page or post you want to link to, and choose from the results shown below this. If you wish to alter the title of the link text, do this in the box next to ‘Link Text’. If you want the link to open in a new tab or window, check the box ‘Open link in a new tab’ located underneath the title. To finish, click the ‘Add Link’ button at the bottom of the Link Options dialogue box. Tip: A good link title not only helps your readers decide if they want to follow the link, but also helps search engines find content in your site. Back on the Edit Post screen, click on the ‘Preview changes’ button in the top right of the Publish module. Here you can check how your changes will appear on your site before you make them ‘live’. When you are satisfied, click on ‘Update’ to publish them to your website. What if I want to remove a hyperlink? To remove a hyperlink from your text, place your cursor (so it’s flashing) in the link, then click on the ‘Remove link’ icon in the Toolbar. It looks like a chain link breaking in half. Need help with your WordPress website? If you need help caring for your website, give us a call on 01579 559 699 during work hours or contact us at any time via email. How To Style WordPress text as paragraphs and headings. What is the WordPress Toolbar and how do you use it? Just email or phone for a chat. WordPress Care Plans – Save time, save money, save your sanity! Strictly Necessary Cookies are enabled at all times and cannot be disabled as they are used to help protect and secure our website against malicious intent.